MOOSIC, Pa. -- Joe McCarthy came home for the International League finals. In large part because of him, the Durham Bulls are leaving with the Governors' Cup. "It's Game 5. We're in Scranton. The championship game," McCarthy said. "I was overcome with joy." McCarthy drove in four runs, homering and doubling twice, as the Bulls defeated Scranton/Wilkes-Barre, 6-2, in a winner-take-all Game 5 on Saturday at PNC Field. 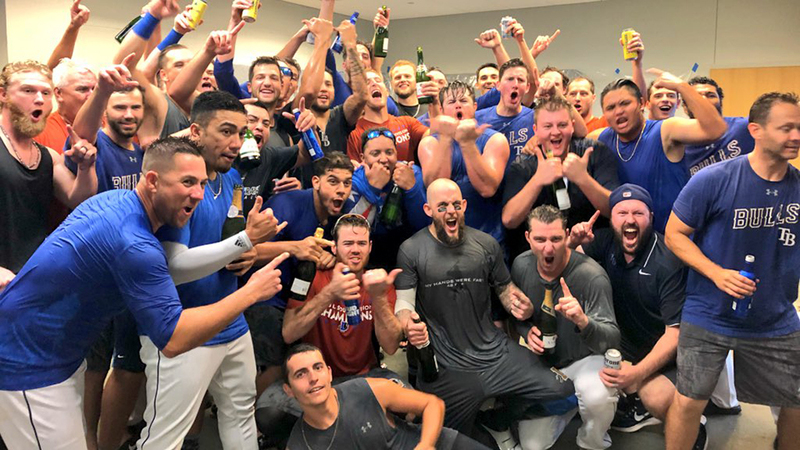 Durham will meet Memphis, the Pacific Coast League champion, in the Triple-A National Championship Game on Tuesday night in Columbus, Ohio. McCarthy's three-run double down the right field line stretched the Bulls' lead to 6-0 in the third inning. It was one of the defining moments for the player who received applause in every at-bat during his homecoming. McCarthy, an outfielder, missed Durham's regular-season trip to PNC Park due to a back injury, sitting out about 2 1/2 months during the rehab process. At one point, he figured his season might be over. "For this to happen in my hometown in this fashion after two months, when I thought I was on the shelf for the year and missed the series here earlier ... " McCarthy said. "[Coming home], it was a little tough to deal with some of the distractions. I love these guys here. This is my home. Throughout my career, I've had a tremendous amount of support from people here, and to come and do this in my hometown is unbelievable." The Rays' 18th-ranked prospect returned last month, but it took time to get cranked up. It was all worth it with the chance to play in the postseason. "For it to turn out that way is a dream come true," he said. Bulls manager Jared Sandberg discussed the hometown impact with McCarthy prior to the series. After Game 5, he was thrilled to see the 24-year-old rewarded. "I told him, 'Thank you for getting healthy and for coming back,'" Sandberg said. "I think he learned from his experience the first couple of days here, and that really helped him settle in." McCarthy's homer was a no-doubt shot to right field and set the tone for Durham. "It kind of felt some of the weight come off my shoulders," McCarthy said. The Bulls hadn't scored against RailRiders starter Domingo German in 23 innings, spanning two seasons. The right-hander was the Game 1 starter as the RailRiders opened the series with a win. McCarthy and former RailRider Rob Refsnyder rapped back-to-back, two-out doubles in the third, chasing German (0-1). Austin Meadows greeted reliever and top Yankees prospect Justus Sheffield with an RBI single. McCarthy cleared the bases with his double in the fourth, Durham's only hit in the inning. Refsnyder was named IL postseason MVP. "It was a competitive series and a fun series," he said. "Obviously, without Joe, we wouldn't have won." The final three games of the series were moved to PNC Field due to Hurricane Florence. "We played this series with everyone back home dealing with the hurricane in our hearts," Sandberg said. Mike Ford got Scranton/Wilkes-Barre on the board with his third homer of the series, a two-run shot in the sixth off Colin Poche. The Bulls used five pitchers, part of a plan to mix it up for the final game. Kyle Bird went the first two innings and Ruben Alaniz (1-0) followed with two perfect frames, striking out two for the win. Sandberg used pretty much his entire roster to win the series. "It's not easy looking at the roster turnover, the distractions that happen at Triple-A," he said. "But this was an incredible year. It never gets old. The winning is very, very difficult." It's Durham's sixth Governors' Cup, but the first time in four tries that the Bulls won Game 5 in the Finals.